Hyperconnected. Always on. These terms have been invented to describe the environment created when people are linked continuously through tech devices to other humans and to global intelligence. Teens and young adults have been at the forefront of the rapid adoption of the mobile internet and the always-on lifestyle it has made possible. The most recent nationally representative surveys of the Pew Internet Project show how immersed teens and young adults are in the tech environment and how tied they are to the mobile and social sides of it. Some 95% of teens ages 12-17 are online, 76% use social networking sites, and 77% have cell phones. Moreover, 96% of those ages 18-29 are internet users, 84% use social networking sites, and 97% have cell phones. Well over half of those in that age cohort have smartphones and 23% own tablet computers like iPads. YouTube users upload 60 hours of video per minute and they triggered more than 1 trillion playbacks in 2011 – roughly 140 video views per person on earth. Following is a selection from the hundreds of written responses survey participants shared when answering this question. The selected statements are grouped under headings that indicate the major themes emerging from these responses. The headings reflect the varied and wide range of opinions found in respondents’ replies. Most of the survey respondents with the largest amount of expertise in this subject area said changes in learning behavior and cognition will generally produce positive outcomes. David Weinberger, senior researcher at Harvard University’s Berkman Center for Internet & Society, says values will evolve alongside the evolution in ways of thinking and knowing. “Whatever happens,” he wrote, “we won’t be able to come up with an impartial value judgment because the change in intellect will bring about a change in values as well.” Alex Halavais, an associate professor and internet researcher at Quinnipiac University, agreed. “We will think differently, and a large part of that will be as a result of being capable of exploiting a new communicative environment,” he noted. 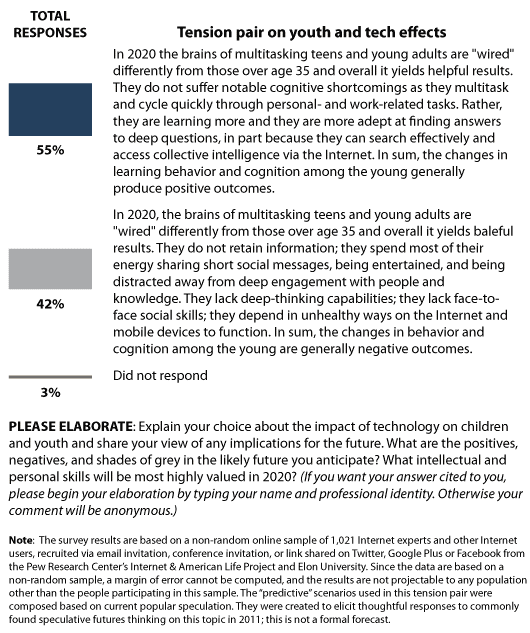 A number of the survey respondents who are young people in the under-35 age group—the central focus of this research question—shared concerns about changes in human attention and depth of discourse among those who spend most or all of their waking hours under the influence of hyperconnectivity. Jesse Drew, an associate professor of technocultural studies at the University of California-Davis, echoed Braman. “My fear is that though their cognitive ability will not be impaired, their ability to think critically will be, and they will be far more susceptible to manipulation,” he wrote. Interpersonal skills have eroded to a point where many people no longer have a sensibility for exercising what might have previously been described as tact or social graces. The manner in which communications occur (or do not occur) allows people to artificially wall themselves off from anything unpleasant or unanticipated or complicated. There is an increase in mental illnesses related to disassociation and alienation. All communications must be short, visual, and distracting/entertaining. The intellectual attributes that may become highly valued are those that concern particular expertise in an area that requires study and the consolidation of information over time. On the other hand, presentation and on-screen personality may trump expertise as people come to rely on people who merely present information in an entertaining and digestible fashion causing the least amount of cognitive dissonance. Branding and politics are ruled by those who can mount the most entertaining ‘noise’ on the most effective platforms. Education will have largely moved ‘on-screen’ in the class and online at higher levels. There is a decline in people’s ability to communicate verbally. Language will simplify to conform to the new requirement for bite-size messages. Libraries will continue to consolidate themselves into fewer outlets as crosses between repositories for ‘dead media’ and community centers for public Net access and entertainment. There will be a further emergence of virtual associations in things like game ‘clans,’ online special interest groups and groups formed through social networks. Personal skills like those that enable people to get others to cooperate in work settings will be more at a premium as are people with ‘people skills’ such as those required for psychiatric services, mediation and social work. Organizational skills that allow people to see the ‘big picture’ and to coordinate others may be even more highly valued than they are now. There will be an increase in accidents and things going wrong due to miscommunication and the widespread combination of sleep deprivation and fractured attention spans. Tin Tan Wee, an internet expert based at the National University of Singapore, estimates a slow movement to try to adapt to deal with the likely divide. “After 2020,” he predicted, “more-enlightened educators will start developing curricula designed to tap a post-internet era. After 2030, educational systems, primarily private ones, will demonstrate superior outcomes on a wider scale. After 2040, governments will start realising this problem, and public examination systems will emerge. A number of people who identified themselves as teachers answered this question as anonymous respondents and most of them expressed frustration and concern for today’s students. Several noted that they have seen things “getting worse” over the past decade. Is this at least partially due to the fact that they are still trying to educate these highly connected young people through antiquated approaches? Perhaps those who have argued for education reform would think so. The word “multitasking” has firmly rooted itself as the primary descriptor used to refer to the task-juggling and attention-switching that is part and parcel of the hyperconnected lifestyle. Multitasking is a common act among today’s teens and 20s set. The semantics of the word have been argued, with many saying it is not possible to perform multiple tasks simultaneously. David Ellis, director of communications studies at York University in Toronto, has a front-row seat to observe how hyperconnectivity seems to be influencing young adults. He said it makes them less productive and adds that most of them do not understand the new digital tools or how to use them effectively. “The idea that Millennials have a cognitive advantage over their elders is based on myths about multitasking, the skill-sets of digital natives, and 24/7 connectedness,” he commented. “Far from having an edge in learning, I see Millennials as increasingly trapped by the imperatives of online socializing and the opportunities offered by their smartphones to communicate from any place, any time. “I can see this in the living experiment that takes place every week in the computer lab where I teach internet technologies to fourth-year communication studies majors. Students everywhere have become relentless in their use of mobile devices for personal messaging. Even good students delude themselves into thinking they can text friends continuously while listening to a lecture and taking notes and, in the process, retain information and participate in discussions. But good research has shown that even especially bright kids are less productive when multitasking, a finding resisted by plenty of grown-ups as well. “Our fondness for thinking positively about multitasking, especially among the young, gets a lot of reinforcement from two other assumptions: that Millennials have a special aptitude for digital media because they’ve grown up digital; and that ubiquitous, seamless connectivity is a positive social force. The first assumption is baloney; the second is fraught with contextual problems. Of the hundreds of liberal arts students I’ve taught, not one in ten has come into my class with the slightest clue about how their digital devices work, how they differ from analog devices, how big their hard drive is, what Mbps (megabytes per second) measures. In other words, they’re just like people who haven’t grown up digital. And of course the immersive nature of 24/7 connectedness creates the illusion that Millennials can somehow tap into a form of collective intelligence just by being online, while looking impatiently for messages every three minutes. Rich Osborne, senior IT innovator at the University of Exeter in the UK, said his own life and approaches to informing and being informed have changed due to the influence of hyperconnectivity. “As I am in possession of just about every technical device you can name and I am using just about every cloud service you can think of, you’d think I’d be all for this,” he observed. “But I’ve started to wonder about how all this use of technology is affecting me. I strongly suspect it’s actually making me less able to construct more complex arguments in written form, for example—or at the very least it is certainly making such construction harder for me. Of course it might be other issues, stress at work, getting older, interests changing, any number of things—but underlying all these possibilities is the conscious knowledge that my information-consumption patterns have become bitty and immediate. Human tendencies drive human uses of technology tools. Many of the people participating in this survey emphasized the importance of the impact of basic human instincts and motivations. Survey respondents say there’s still value to be found in traditional skills but new items are being added to the menu of most-desired capabilities. “internet literacy” was mentioned by many people. The concept generally refers to the ability to search effectively for information online and to be able to discern the quality and veracity of the information one finds and then communicate these findings well. Tom Hood, CEO of the Maryland Association of CPAs, shared feedback from hundreds of grassroots members of the CPA profession, who weighed in on the critical skills for the future in the CPA Horizons 2025 report and arrived at these: 1) Strategic thinking—being flexible and future-minded, thinking critically and creatively. 2) Synthesizing—the ability to gather information from many sources and relate it to a big picture. 3) Networking and Collaboration—understanding the value of human networks and how to collaborate across them. 4) Leadership and communications—the ability to make meaning and mobilize people to action and make your thinking visible to others. 5) Technological savvy—proficiency in the application of technology.